Ski in ski out! Méribel-Mottaret, located at the heart of the 3 Valleys, certainly boasts the best situation in the resort to take full advantage of the largest ski area in the world. Specifications in Meribel : Its architecture consists of a set of chalets with facades of stone and wood. Chalets and residences perfectly integrated on the four main areas of the resort: the Allues (1100 m), Meribel Centre (1400 m), Meribel Village (1400 m) and Meribel Mottaret (1700 m). 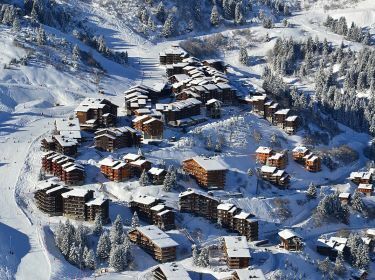 A friendly hamlet with modern residences at the foot of slopes, Méribel-Mottaret is the ideal venue for families. Mottaret Situated at the top of the Méribel valley, the village of Mottaret offers privileged access to 600 km of the 3 Valleys ski slopes. Located in the heart of the 3 Valleys, Meribel has a privileged site that provides access to a wide variety of skiing thanks to its ski area, the largest in the world, with a lift system more efficient. Its snow park is a reference for freestylers throughout Europe, both expert and novice. Plus: the snow in Méribel-Mottaret is guaranteed throughout the entire winter season ! In figures: 150 km of track. 66 tracks including 7 black runs, 24 red runs, 27 blue runs, 8 green runs.